Whether you're coming for its rich history, bountiful nature, or incredible beaches, The Bahamas has so much to offer that it's virtually impossible to run out of things to do, here. Discover the country's numerous heritage sites in the shape of old plantation estates, beautiful lighthouses, historic villages, monastery ruins, wreck diving sites, and significant landmarks immortalising the steps of Christopher Columbus and other predominant characters. Explore the extensive display of natural beauty found both on the land and in the sea, including the country's abundant collection of Blue Holes and caves, underwater walls, picture-perfect beaches, as well as terrestrial and marine national parks and reserves, where the best of the Bahamian wildlife thrives away from the busy civilisation. When it's time to indulge, the islands greet you with facilities that are designed with pleasure in mind: from soothing spa centres, vibrant marketplaces, stunning golf courses, exciting water-parks, tasty cuisine, and beach-side entertainments, The Bahamas has is all to make you experience the trip of lifetime! The seclusion of the Out Islands is unbeatable. These remote gems are easy to visit if you're looking for a secluded vacation spot where you won't find cruise ships, high-rise hotels or crowds; the perfect romantic get-away or honeymoon spot if you just crave some peace and quiet on your holiday. Take a trip over the enormous bridge and discover Paradise Island. From Nassau you can see a giant arching bridge; the bridge is a quarter of a mile long! The Atlantis hotel, frequented by celebrities is also here; some don't leave the resort; there's so much to do inside. Known as the best boating and sailing destination in the world. The islands of Acklins and Bimini lure fishermen, divers and snorkelers. Andros is a natural wonder and has the third largest barrier reef in the world. Though small, there's plenty to see and do with miles of hiking trails and clear water filled with coral reefs, blue holes caves and shipwrecks- plus the highest point in The Bahamas! 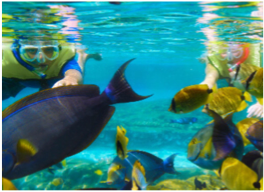 Ecotourism is so important in The Bahamas that a whole month is dedicated to it in October every year, with an entire month of events celebrating the country's natural environment. Enjoy exotic wildlife and botanical gardens. The most photographed spot in The Bahamas that is frequently used for wedding ceremonies is The Grand Bahama’s Garden of the Groves. Home to over 12 acres of exotic wildlife and botanical gardens, children come for the farm animal petting zoo. This 33,235 acres large National Park was established in 2002, with the goal of preserving the area's wildlife and natural beauty. There, you can admire the beautiful geological formations known as blue holes, wander around the creeks and wetlands to spot and observe some of the island's rare protected wildlife. click here to download everything about the Bahamas! Tee off at one of the best golf courses in the Caribbean. Lucaya Resort on the Grand Bahama Island is one of the best for golf which you can experience for yourself on one of two 18-hole, par of 72 golf courses. The Reef Course which opened in 2000 offers open fairways, rolling greens, and an assortment of tall grasses, treacherous bunkers and huge lakes has been called a "Scottish-like course, but a lot warmer". The shallow, clear waters of The Bahamas give the perfect conditions for some snorkel-based exploration of the marine life hiding in the thousands of square miles of lush coral reefs. Beautiful marine life and great vistas can be expected on wall dives around the Bahamas islands, will walls ranging from a 60 to 100 feet deep sand bottom dive, to bottomless descents, bursting with a variety of coral and sponges creating a stunning underwater garden. A popular coral cliff beginning in 35 feet of water and located off the northwest coast of New Providence Island (Nassau). A nearly continuous wall facing the Gulf Stream, with a North Wall starting in 120 feet of water, and with several walls to the south, such as South Cat Cay Wall, Riding Rock Wall, and Victory Cays Drop-off, all starting in 30 to 90 feet of water and abounding with tropical fish. The southern end of San Salvador abounds with popular wall sites, along its western coast. Benefiting from more sunlight which allows coral to grow quickly, these sites tend attract a lot of fish, creating a dramatic rainbow so shallow it is often accessible to snorkelers. Furthermore, the shallow depth means divers needn't worry about their bottom time. With so many islands and cays to discover and a perfect weather year-round, The Bahamas is a country best explored by sea, and with a never-ending list of picture-perfect places to travel, it's no wonder it is such a popular sailing destination. Whilst Blue Holes are not exclusive to the region, The Bahamas counts more of them than any other place in the world, and is the only place where tidal blue holes are found. Although blue holes are home to some unique organisms, the real thrill in diving them comes from the geological experience. Grand Bahama's southern coast is surrounded with a continuous reef and drop-off with hundreds of walls featuring swim-throughs, caves and caverns, with the top of the wall beginning at an approximate depth of 80 feet. A several miles-long colourful coral canyon with sponge-decorated pinnacles, located near the New Providence side of the Tongue of the Ocean. A 75 feet deep vertical wall facing the Exuma Sound, located off Highbourne Cay. Featured in many Hollywood films, including James Bond, New Providence's south area counts several wrecks that were placed there as underwater film sets. Among those are the popular sites of the Vulcan Bomberfrom "Thunderball" and the vessel Tears of Allah from "Never Say Never Again". With its waters being home to plenty of exotic fish, The Bahamas is a great place for some fishing fun, whether you're a complete novice or a record-breaker. You'll find many operators offering a variety of fishing trips for you to experience, ranging from big game fishing (tuna, marlin, wahoo), deep sea fishing, fly fishing, and reef fishing (rigger fish, snappers, yellow fins). The Bahamas is reputed for offering great dolphin encounter opportunities, and these are one of the country's most popular activities enjoyed by visitors, whether in a marine mammal facility or the open ocean. These dives are offered by several operators around the country, with some of them also offering the possibility of swimming with sharks, which may well be the most exciting and unnerving hour you'll ever spend underwater. A wall beginning in 45 to 60 feet of water and fully decorated with stunning coral and sponge formations. Regarded as one of the country's most colourful and dramatic wall dives. Regarded as The Bahamas' greatest wall dive, a large site featuring canyons and mountains of every shape and size. Running continuously from the southwest end of Chub Cay to Whale Cay in The Berry Islands, and featuring various wall formations. What makes deep wrecks so impressive is that, lying at a depth of 100 feet or deeper, they virtually remain untouched by the destructive consequences of most storms, giving you this spectacular and slightly spooky image of an intact vessel, with details become clearer as you swim deeper and deeper. Opened in 1976 by Bahamian artist Alton R. Lowe, in honour of his father who was a well-known woodcarver of ship models, the museum aims to preserve and document Abaco's heritage and development from the Loyalists era. Standing at 89 feet and counting 101 steps, this lighthouse is one of only two remaining beacons saved from automation, which the residents are strongly opposed to. However, this was not always the case: during the 1860's, when the British Imperial Lighthouse Service set to build the candy-striped tower, the locals -who saw it as a threat to their wrecking trade- went as far as sinking a barge that was used to transport building materials. Named after the town's founder who settled here from South Carolina, this museum was opened in March 1978 and created by the local community, who put a lot of effort into gathering documents, information, manuscripts, photographs, artefacts, pottery and china from shipwrecks, as well as household antiques, to preserve the heritage and legacy of the island, whose history dates as far back as the 1780s. Located near the Albert Lowe Museum and also created by Bahamian artist Alton Lowe, the garden was built with funds raised by the New Plymouth Historical Society and is an homage to those who played a significant part in the history of the Abacos. Named after its geological formation, this lighthouse was built in 1836 by the British Imperial Lighthouse Service and is the country's oldest, as well as the first one to be built on The Abacos. Unlike the Elbow Reef Lighthouse which has retained its original kerosene beacon, the mechanism of the lighthouse has been dismantled and is now operated automatically without the need of a lighthouse keeper. Originally built in the mid 19th century, Green Turtle Cay's jail was a two-storey structure that was severely damaged by a hurricane in 1932, and its upper level destroyed. The jail was not rebuilt but was instead made one of the community's historical features. Located at the northeast peninsula of what is now known as Treasure Cay Beach, Carleton Point was the founding city of Treasure Cay, built by 600 American Loyalists who migrated to The Bahamas and created the settlement in 1783, following their allegiance to Great Britain during the American Revolution. 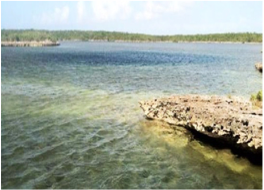 Located near Marsh Harbour, this unique geological formation is an insight on what The Bahamas must have looked like before the arrival of human beings, and has produced a large amount of fossils of great quality. Located at the southernmost tip of Acklins, this 1867 lighthouse sits on the remote Castle Island, and once served as a shelter to pirates attacking ships sailing in the nearby passage. Located about 5 miles away from the main settlement, Salina Point. Originally called "Fortune Island" by Christopher Columbus, after he found a conch pearl on his arrival, the island is known for being home to the country's very first jail, most of which is still standing, was the first port of entry in the southern Bahamas, and served as Administrative headquarters for the three-island atoll. Located east of Mason's Bay, these two islands are a protected reserve for the endangered great iguana, and the rare hutias, a guinea pig-like rodents that is the country's only native mammal. Located at the northwestern point of Crooked Island, on a cay just off Pittstown Point, this 1876 town house stands proudly at 112 feet above sea level, and serves as a beacon to the northern entrance of the much travelled Crookes Island Passage. Legend has it that Columbus anchored there for a while on his arrival in The Bahamas. The site owes its name to the wells that were dug by the French pirates you used the area as their hideout during the years of piracy. The site enabled the pirate ships to remain hidden and to use the Crooked Island Passage to attack the merchant ships. In response to the piracy threat, the British built a fort at Gun Point, the remains of which can still be seen near the shoreline, including an old cannon. Located just south of Spring Point, along Pompey Bay Beach, this ancient Lucayan Indiand site is believed to be one of the largest Lucayan settlements in The Bahamas, and is one of the many sites discovered on the island, with ten more being located in Samana Cay. Located at its highest point, this settlement boasts the best views of the island, and is home to the local Post Office, Police Station, Central Park, as well as the Central and Local Government offices. 3.6 acres of protected land including two Loyalists sites featuring an artillery battery and a 19th century plantation house which was the plantation's centrepiece around the reign of George V of England, and the ruins of which are now surrounded by aloe and other overgrown plants from the property's gardens. Proclaimed a National Park in 2002, and managed by the Bahamas National Trust, the Marine Farm site was once home to an 18th century British fort that now acts as a powerful reminder of the country's history, with ruins of the main house and kitchen, and a military section with historic drawings, artefacts, and cannons displaying the king's seal. Established in 1818 by two slave traders, London Anglican priest Joseph Evans and Harbour Island resident Arthur Sweeting, All Saints started as a leaf tent to then be upgraded to a wooden, then stone structure in 1891, and is Mangrove Cay's oldest building. A 2,979 acre-large National Park established in 2002, providing ideal living conditions for crabs in Central Andros, as well as protecting the biological resources by implementing sustainable exploitation strategies. This 1892 lighthouse was built to mark the southern entrance to the Fresh Creek Channel. In 1952, three cannons, salvaged from the 1800s wreck Cottsac Schooner, as well as a tower were added to the building. This National Park was established in 2002 to protect The Bahamas' most productive marine nursery that are the area's pristine coastal wetlands. It is home to the bonefish and is a prime feeding ground for the endangered West Indian Flamingo. Located half a mile south from Pleasant Harbour, these ruins are a great example of vintage Bahamian-style architecture. It is unknown why these 1930s properties were abandoned, but they are opened to exploration. Located one-quarter mile north of the Bullock's Harbour Government Complex, the depth of this 60 feet-diameter blue hole is unknown, but is suggested by the dark blue waters in its centre, that Jacques Cousteau is said to have dived. Created by the Bimini Historical Society in an effort to preserve the island's heritage, the museum gathers a collection of artefacts, pictures, object and stories of those who played a part in the development of the island, as well as some memorabilia of Bimini's most famous former resident, Ernest Hemingway. This 1887 church commemorates Blayney Townley Balfour, who was Governor of the colony when the Emancipation Act was passed in 1834. As the population of Old Bight decreased and the services discontinued, the building was deteriorating until it got restored in 2012, still displaying the original plaque that was laid in 1889. After sailing vessels were replaced with steamships, shipping traffic considerably increased along the Northwest Providence Channel, which led the British Imperial Lighthouse Service to built the Great Stirrup lighthouse in 1863, a 46 feet-high building now powered by solar-panels. Legend has it that the four blue holes that compose the Great Lake and leads to several underground caverns is home to a mermaid, that many locals report to have seen. The Great lake is 65 feet wide and 10 feet deep. 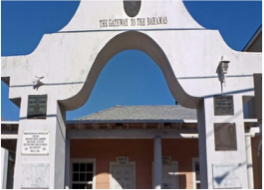 This 1935 monument was built to commemorate the 100th anniversary of Bimini's settlement by ship-wreckers in 1835, and features the inscription "The Gateway to The Bahamas". A site that can be explored freely and that used to be the home of Loyalist Colonel Andrew Deveaux, an American Revolution War veteran who was given the land in 1783 in an attempt to protect and recapture Nassau from the Spanish invasion and occupation. The site's ruins include the stone structure of the 18th century great house and outbuildings. Locally known as Como Hill, and standing at a height of 206 feet, this is the highest point in The Bahamas, built in 1939 by Monsignor John Hawes (locally known as Father Jerome) who, it is believed, named the place after the La Verna hill in Tuscany, which was given to St Francis of Assisi to peacefully contemplate. An inland blue hole surrounded by three walls, perfect for a dip and a snorkel. Located just south of Surfer's Beach, this mile-long cave is filled with stalagmites and stalactites, giving the impression of an underground cathedral when lit by a torch light, and features centuries old charcoal graffiti. Located two miles east of Gene's Bay, this cave was discovered by William Sayle and a group of Christians fleeing Bermuda, who were shipwrecked off the Eleuthera coast on a reef called the Devil's Back Bone and found refuge in the cave. The group shaped an altar from a large boulder located at the back of the cave, and where the island's first religious service was conducted, giving the cave its name. A majestic demonstration of natural beauty where a 30 feet wide stretch of rocky land separates two distinct shades of blue sea, with the deep shade of the Atlantic Ocean on one side, and the emerald translucent colour of the Caribbean sea on the other. One of the few places on Earth to offer such magnificent phenomenon. Harbour Island's main street is home to many historical buildings reflecting the island's heritage, such as Dunmore Cottage, the Plaque of the Early Parliamentarians, The Shipyard, The Sugar Mill, The Harbour Lounge, The Fig Tree Park, The Old Jail House, and the Old Fort. Eleuthera's first National Park was created by the Bahamas National Trust (BNT) and the Leon Levy Foundation to preserve the woodland coppice and mangrove forest in order to protect the indigenous species living in the is 25-acre sanctuary. This 1768 church is the country's oldest religious foundation, created by the descendants of the Eleutheran Adventurers, who were a group of Bermudian Christian seeking religious freedom and landed on Eleuthera in 1647. Legend has it that this house was that of a newlywed couple who, shortly after settling in the house, had a terrible argument that led the bride to leave in a hurry, and the groom to follow shortly after. Everything was left behind and remained untouched, from that night's dinner table and food on the stove, to clothing and wedding gifts, as they never returned. Just like Bay Street, Dunmore Street is home to many of the island's historical edifices, including the homes of many prominent Bahamians who played a key part in the development of Harbour Island. Among those are the Sir George W.K. Roberts Library/Museum, the Higgs Family Tomb, Crown Land Grant, Dundas Monument, and The Administrator's Residence. If you happen to visit Eleuthera, take a stroll along the cliffs at Rainbow Bay, and climb up to get a beautiful view of the surroundings and enjoy the infinity pool. Built by Governor William Frederick Haynes Smith in 1897, this edifice is the island's oldest Government Complex. The building was restored by the local Friends of the Library organisation, who made it possible to reopen it as the local library. Also known as the Hot Tubs, these natural pools are located 0.6 miles south of the Glass Window Bridge, and is best appreciated at low or medium tide.